Soon after March arrives, Disneyland starts getting busy. If you're looking for a relaxed visit with shorter wait times and smaller crowds, go during the first week of the month. It will be busy at Disneyland in March after that and the parks will be extra crowded during spring break. The weather should be comfortable all month, although there is a chance of rain. 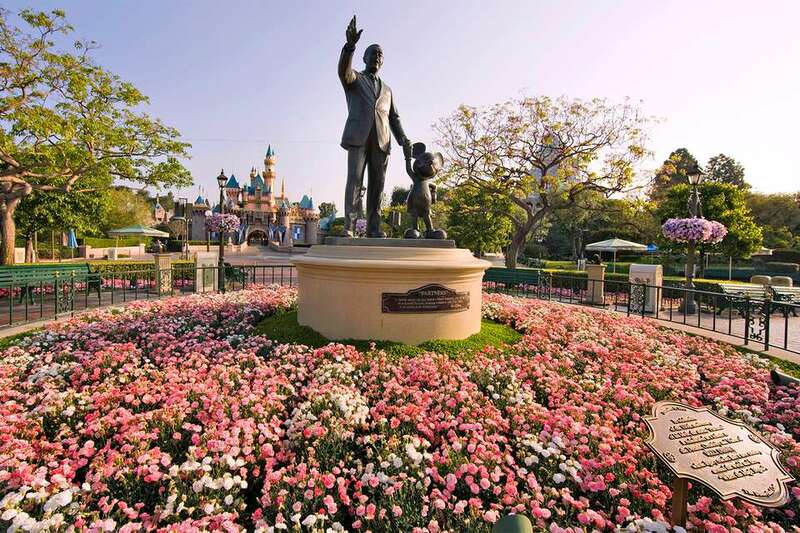 If you have flexibility in your travel plans, check the pros and cons of visiting Disneyland in spring. These tips will help you plan your Disneyland vacation the easy way. The crowds at Disneyland get unbearably large as the month continues and students are out on spring break so plan your trip for the first half of the month.Use Isitpacked.com's crowd forecast calendar to get a day-by-day prediction. If you're thinking about going to Disneyland in March, think about the crowds in two parts: early March and the rest of the month. If you go to Disneyland during the first few days of March, it’s delightfully uncrowded. You can arrive at noon and get a parking spot on the third floor of the seven-story Mickey & Friends parking lot. You can even get a table for lunch at some of the restaurants with no reservations and no wait. Many rides will have 10 to 20 minute wait times, but Fastpasses for the most popular rides will be gone by noon, leaving you standing in line for an hour or more. If you go after spring break season begins, things get much busier. In fact, it might not even seem like the same place, with waits for everything in the 30- to 60-minute range (or longer). By the last two weeks of March, those wait times will be up to an hour (and sometimes up to two). Going during that busier time requires patience and planning. In California (where many Disneyland visitors live), schools schedule their breaks between mid-March and the end of April, regardless of the religious holiday. In other parts of the country, the annual school break is tied to Easter, which happens between March 22 and April 25. The California Adventure Food and Wine Festival begins in March and runs through most of April. You will find more than a dozen marketplace stands near the World of Color viewing area. They serve food items inspired by fresh, California-grown ingredients and you can also sample locally brewed craft beers and wines. You can walk up and buy just one item (or a few) but if you plan to sample a lot, get a Sip & Savor pass which gives you eight coupons for a price less than you would pay for the same number of items a la carte. You can also watch free cooking demos on the Backlot Stage in Hollywood Land. Besides the food marketplaces in the park, you can enjoy other culinary experiences. Buy tickets to a dinner with the Disney chefs. Or watch cooking demos by some of TV’s super-star chefs, or from a big-time food celebrity like Guy Fieri. Your little budding chefs can participate in a Jr. Chef experience designed just for kids. On the alcoholic side, you can try some new cocktails at Sonoma Terrace, learn more about wine, beer and spirits at tasting seminars, or attend a winemaker reception at Carthay Circle. These averages can help you get a rough idea of what the weather will be like. Like most other places, Disneyland sees a variety of spring weather. Some years, California's winter rains continue, but in others, it can be dry and very pleasant. Once in a while, it can be blisteringly hot. At the extremes, Anaheim's record low temperature in March was 30 F (-1 C), and its record high was 108 F (42 C). If you're trying to decide what month to go and want more information about the weather year round, use the Disneyland weather and climate guide. You may find rides closed for major refurbishments early in the month, but by the time the spring break crowds arrive, most of them should be open again, unless they're undergoing an extensive overhaul. Check touringplans.com for a list of rides which are expected to be closed for refurbishment. You may also find unexpected closures that happen when something breaks and must be fixed. Hours at California Adventure are often shorter than at Disneyland and both parks will be open longer on holiday weekends. If you are checking no more than six weeks ahead of time, use the Disneyland website to get the official Disneyland hours by day. More than six weeks out, you can use this guide to find out more about hours in general. Daylight Saving Time ends in mid-March. If you go after that, you get more daylight in the evening. The easy way to get the start date for Daylight Saving Time is to search for "daylight savings time start" in any search engine. You can start planning your Disneyland wardrobe ahead of time, but don't rely on averages to make your final plans. Instead, check the weather forecast a few days ahead. If rain is in the forecast, don't take an umbrella, They make it hard to move around, and they're a nuisance to stow every time you want to go on a ride. Instead, take a poncho or hooded rain jacket. And if you have a stroller, don't forget something to keep it dry. Even when it isn't raining, the weather may be too chilly to make running around in damp clothing a comfortable experience. If you want to go on any water rides, take a plastic poncho and choose clothing that will dry out quickly. Cotton fabrics can stay soggy and uncomfortable for hours, making synthetics a better choice. Otherwise, the best thing to wear to Disneyland in March is something comfortable, with a few layers that are easy to carry. And no matter what you do, don't wear new shoes. That is, unless you just like to get blisters on your feet. Get more tips about what to wear in general and what to carry in your day pack in the guide to Disneyland weather and climate. There are no extra annual events at the Disneyland park in March, but during Mardi Gras, there will be some special activities around New Orleans Square. If Easter falls on a March Sunday, some of the Downtown Disney restaurants may offer an Easter brunch menu. Starting in March, Disney California Adventure hosts a Food and Wine festival that will last through mid-April. Disney often offers promotional deals that extend through early March, selling adult tickets for the kids' price or Park Hoppers at the price of a one park per day ticket. You may have to buy the tickets before the end of February. Hotel costs will stay low in the Disneyland area until Spring Break starts.